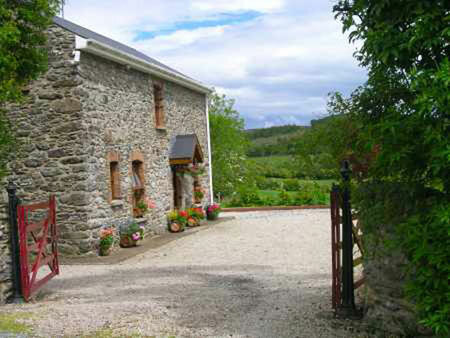 The Barn offers self catering accommodation located in Foxhall near the large town of Letterkenny in County Donegal. A tranquil river bank setting makes this an ideal retreat and central base to explore the scenic beauties of Donegal. The accommodation comprises 3 bedrooms with wooden floors and en suite facilities (downstairs). The open plan kitchen, dining and living area (upstairs), has a large picture window overlooking Foxhall Wood and has been described by many as "the upside-down house". This riverbank setting is enhanced by mature woodland while the views to the front over the river valley are panoramic. This is ideal country for brown trout and salmon fishing, bird watching, horse riding and hill walking. There are several Blue Flag beaches within 30 minutes driving time while the nearby town of Letterkenny has a variety of shops, a multiplex cinema, leisure centre, 18 hole golf course and theatre.